To Win Over the Crowd: An important skill to have in business and especially in the public relations arena is the skill of persuasion or the ability to win over the crowd. Inside and outside the workplace, the power of persuasion can carry you far and it all starts by honing those public speaking skills. Mastering public speaking results in an increase in confidence and with that, a cool and collected presence in front of an audience. Of course it is imperative to be knowledgeable about the subject you are presenting, but beyond that, when making a persuasive speech of any kind, including a sales pitch to a client, you need to be prepared to answer the opposition, and to speak with poise. To make a strong case, the ability to speak publically is not only important, but essential to make forward strides. For example, in order to express why a certain product or idea would be an interesting topic to an editor of a publication, one must use strong enough, convincing language to elicit intrigue and curiosity. A great pitch will persuade the consumer or editor to want to know more. When addressing any audience with an idea or argument for or against something, public speaking allows you to make your case compellingly and convincingly. To Motivate People: A great public speaker attains the power to motivate his or her audience to do something, stop doing something, change a behavior, or reach objectives. But to carry an idea forward, you must be able to excite and enliven your peers, employees, coworkers, customers. Public speakers are leaders who are able to inspire their audience to work harder to achieve their goals. As a public speaker, your role is to influence your listeners and create an environment where everyone walks out ready to roll. You are not merely giving a speech in the attempt to get your audience to take a certain action; speakers are part of the action and can convey their passion and drive. It is not enough to simply know about the issues at hand but to make your audience share your passion. Elections have been won simply because one candidate was a better public speaker than the other. Being knowledgeable is a factor, of course, but more importantly, being able to arouse passion in people through skilled public speaking will motivate your audience to make a move. When people talk about having a voice in the world, they mean having an impact on the world by voicing your thoughts and your knowledge in an exciting way. A mastery of public speaking allows you to relate to the audience and gain their trust. As a skilled public speaker, you become likeable and believable, and you will be able to inspire and even entertain the crowd. To Inform: The ability to inform is one of the most important aspects of public speaking. From presenting research papers and PowerPoint presentations in school to presenting ideas and pitches to your boss or client, informative public speaking is a vital component of a successful career across all work fields. Once you have their attention, a good informative speech sharing your knowledge of a subject with an audience, enhances their understanding and makes them remember your words long after you’ve finished. For example, you might be asked to instruct a group of coworkers on how to use new computer software or to address your employees on company happenings. Whether it is giving demonstrations or sharing an area of expertise, this form of public speaking is an essential skill in today’s world. According to a study by sociologist, Andrew Zekeri, “Oral communication skills were the number one skill that college graduates found useful in the business world.” Communication skills enhance your ability to interact with professionals and fellow colleagues in a qualified and composed manner. Public speaking improves these skills and thus, makes you a more worthy candidate to move up and succeed in your chosen field. In our career we delivered speeches in hundreds of customer conferences, round tables and seminar series. Given that expertise, we can be engaged in your events and to interact with your targeted audience. 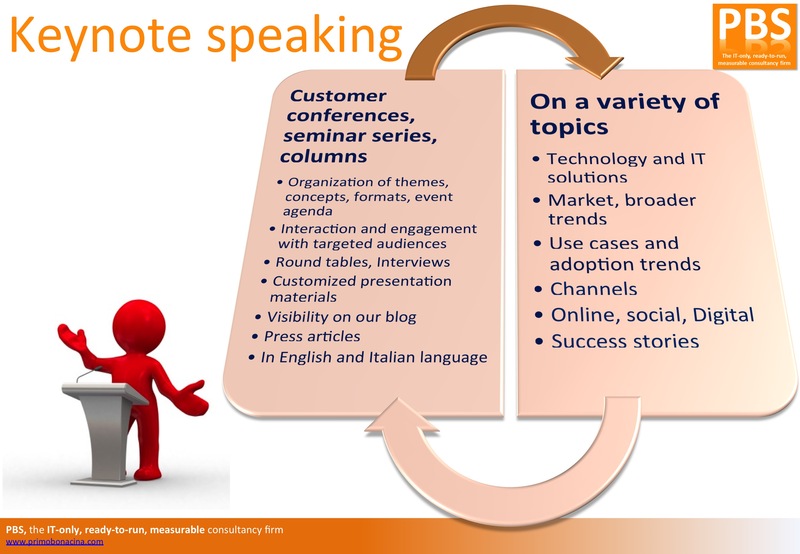 Speeches can be in Italian or English language (presentation materials could be in French or Spanish language too).